Provide comfort for the family of James Bonner with a meaningful gesture of sympathy. COLTON – James Scott Bonner, 63, of Brown’s Bridge Road, peacefully passed away Wednesday afternoon, March 27, 2019 in the comfort of his home with his family and his dog by his side. Jim was born August 26, 1955 in Detroit, Michigan, the second son of six to the late Phillip Ronley and Luella Francis (Craig) Bonner. On August 4, 1984, he married Robin Autenrieth; they were blessed with two daughters before divorcing. His educational path started with his graduation in 1973 from Peru High School. 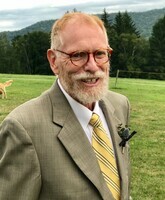 He continued his education at SUNY Plattsburgh, graduating in 1976 with his Bachelor’s Degree and in 1980 with his Masters from Clarkson University. In 1985, he was awarded his PhD in Civil and Environmental Engineering from Clarkson University. Jim started his career in academics at SUNY Plattsburg before accepting a position at Texas A&M University in College Station, where he would eventually become a full professor. Jim served as the Director of the Conrad Blucher Institute, Director of SERF (Shoreline Environmental Research Facility), Director of Research at the Beacon Institute for Rivers and Estuaries, and as the President/CEO of RATES (Research Applied Technology Education Service). He returned to Potsdam, NY in 2006 when he accepted a position as a professor at Clarkson University. Throughout his career, he mentored numerous graduate students who have further advanced the field of Environmental Engineering. He loved the Adirondacks and could be found boating on Hannawa Pond or downhill and cross-country skiing. He is survived by his daughters, Gwen Bonner, MD and her husband, Jason Snyder, of Potsdam and Claire Carey and her husband, Adam, of Meredith, New Hampshire; his beloved granddaughters, Esme and Helen; his companion, Beth Barrett of Pierrepont; and his brothers, Jeff of St. Louis, Missouri, Dave of Albany, New York; Dan of Peru, New York; Jon of Atlanta, Georgia; and Roger of Wilmington, New York; and many close sisters-in-law, nieces, and nephews. To send flowers in memory of James Scott Bonner, please visit our Heartfelt Sympathies Store. Provide comfort for the family of James Scott Bonner by sending flowers. I met Jim when his family moved to our street in Peru, NY in the early 1970's. We were like brothers in high school at Peru and graduate school at Clarkson. I have many fond memories of the crazy things we did together. Jim was a loyal friend; he always made his own judgments about people (and everything else for that matter), and certainly never followed the crowd. He left a great legacy, countless friends, and a beautiful family. I will miss him greatly. From all of Jim's friends at the Texas General Land Office, we offer our deepest sympathies. I had the pleasure of working very closely with Jim when he conducted oil spill research for the agency over the course of a dozen years. He was insightful, innovative and a fine researcher. He was a good friend and he will be missed by all who had the pleasure of his companionship. I knew Jim in high school in Peru NY. He was a great friend. His brother Dave was in my class. My best friend and I spent a lot of time with the Bonner boys hanging out and occasionally getting into trouble... oh the stories make me smile. They felt like brothers back then including Jon and Dan and Roger. I didn't know Jeff very well as he was in college at the time but I did meet him on a couple of occasions when he was home. It seems like I was at their house a lot. Life after high school caused a drifting apart. I would have loved to have continued to know Jim in adult life as it seems he was an amazing man and we would have shared love for education and intellectual pursuits. My heart goes out to the family, even though so much time has passed, I still love you guys. Hello, my name is Rebecca. I am from the Potsdam area. I was reading this obituary and I wanted to say to the friends and family of James Bonner that I am deeply sorry for your loss. I also wanted to share a little word of encouragement that has always helped me in times of distress. A lot of people wonder where they can find help to deal with grief? 2 Corinthians 1:3,4 says, “Praised be the God and Father of our Lord Jesus Christ, the Father of tender mercies and the God of all comfort, who comforts us in all our trials so that we may be able to comfort others in any sort of trial with the comfort that we receive from God.” So it’s nice to know that we can receive form God anytime, anywhere. Thank you for letting me share my comforts. I met Jim decades ago, and am sorry to hear of his passing. My deepest sympathy goes to his family for their loss.